The lovely eyebrow piercing! I went back and forth with myself over if I wanted one or not for years. My biggest concern was a friend ended up getting a black eye after being pierced and I didn’t want to have to explain a black eye – haha! A friend and I had considered getting ours done together but it never ended up happening. 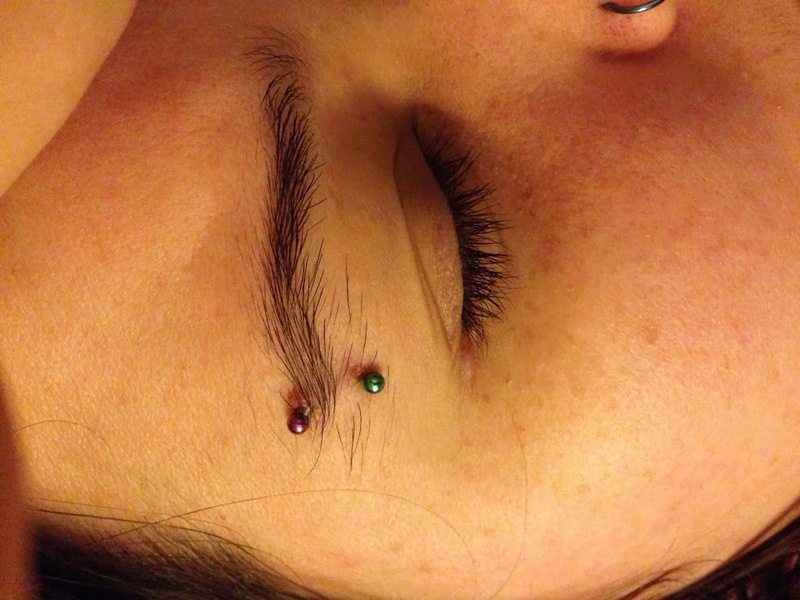 So in a rave of being highly addicted to piercings… I decided to get my eyebrow piercing done. I had it done on August 10th. I had no problems with it at all. Seemed to heal up fine and quickly. I ended up catching it one day in the first couple of months with my hair brush, which only hurt for a little bit and was fine after that. Only issue I had with it, up til mid November, was that it was a bit oozy from time to time. Then in mid November I ended up catching my piercing on my sweater dress. I developed keloids on both sides of the piercing and they didn’t go away. They are slowly going away now, I recently had the barbel downsized to see if that helped and it seems to be working!